Oh yeah, I can cook eggs too. 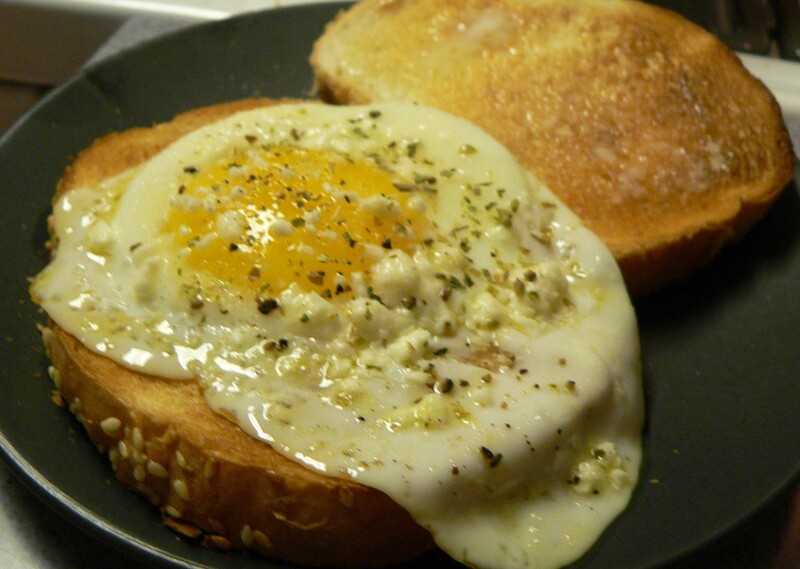 Usually scrambled, but I’ve been known to make ’em runny occasionally… like this morning. Out of oatmeal, shoot. No English Muffins, dang. No bananas on hand, bummer. The only cereal in the cupboard is Frosted Flakes and it’s way too early for a sugar rush. Plus, we don’t have skim milk. Okay, eggs it is. Heat the oil over medium heat. Throw in the egg. Cook until whites are white. Sprinkle with feta, onion powder, thyme, oregano, salt and pepper. Toast the bread and butter generously on one side. I use Mayo as well. Assemble sandwich, butter side in. If you are lucky, the yolk will still be a bit gooey. That makes for some tasty plate cleaning. Yummy! A delicious breakfast in under 5 minutes.